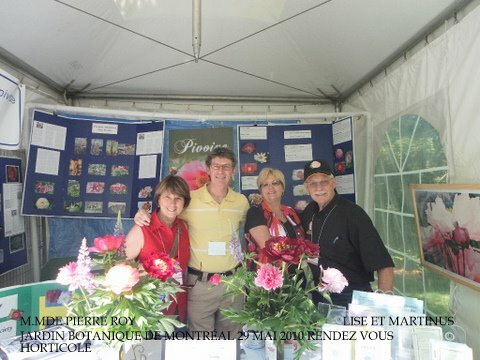 RENDEZ-VOUS HORTICOLE SELON LES ORGANISATEURS PLUS DE 15000 PERSONNES CE SONT RENDUS À L'EVENEMENT,CE FUT UNE TRÈS BELLE EXPERIENCE, L'AN PROCHAIN NOUS ALLONS NOUS IMPLIQUER PLUS À FOND EN PRÉSENTANT DES ATELIERS SUR LES PIVOINES. The overwhelming success of last year's root sale can only be attributed to the generous donations of our members and nursery contacts and to those members who purchased roots. 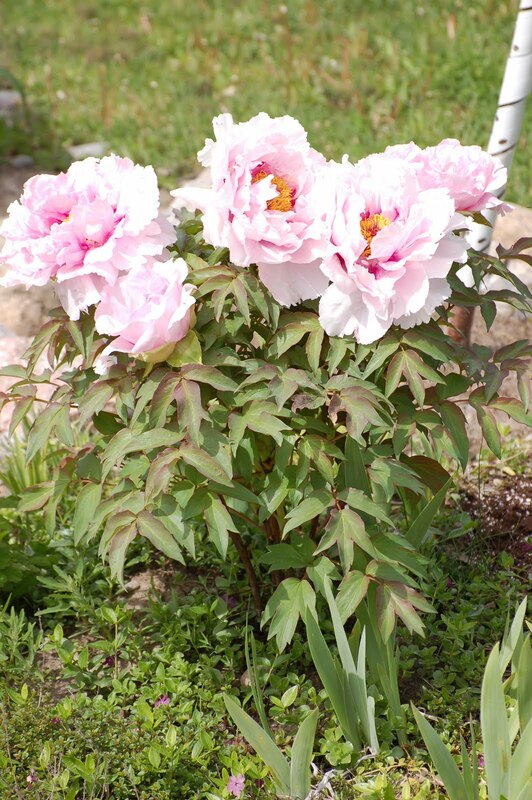 Every year your contributions help generate revenues that helps the CPS continue its mandate to promote the growing, improving and use of peonies in the garden and for home decoration. no later than November 26, 2010. Please note that any receipts received after this date will not be reimbursed. The final list will be published in the August newsletter and we look forward to seeing what the members have to offer for 2010. Dans mon émission, Sophie Bédard parle avec Michel St-Pierre de la Société d'horticulture et d'écologie de Charlevoix. Bonne journée et bonne fin de semaine! Illini Belle is a beautiful ruby red, semi double that blooms early and is a cross between P.lactiflora x P. officinalis. It has symmetrical glossy blooms, with purple stamen filaments and pale green carpels with pink stigmata. This variety needs staking when mature. Grows to 32". Hybridizer is Glasscock 1941. Share your photos of peonies in bloom. Send them in so they too can posted. Thanks for starting this up, Currently I have a Japanese Tree Peony blooming with five of the six buds in bloom. It has lovely dark pink petals on opening that fade to a paler pink with a dark maroon centre. It is beautiful this year; my herbaceous peonies are just starting to bud. 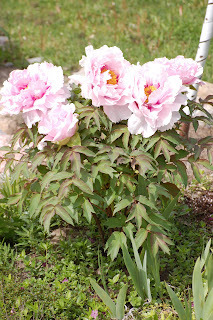 I have a double peony and single blossom peonies that I have moved many times. They originally belonged to my paternal grandmother and then my mother. June 12th and 13th, 2010. The Oshawa Valley Botanical Gardens will have many of its more than 300 Peony plants in glorious bloom during this year’s Peony Festival June 12th and 13th, 2010. 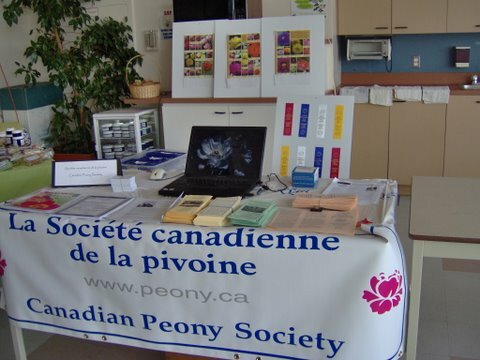 This is the sixth year for this hugely popular show and it promises to be bigger and better than ever as it plays host to the Canadian Peony Society’s 13th annual show and meeting. Children’s Arena, 155 Arena Street, Oshawa, which is adjacent to the Peony Garden, will house a show of cut Peony blooms that will approach 1000 flowers, all displayed in classes and sorted by type and colour. This is an amazing opportunity to see the wide range of blooms that are available in this long lived perennial flower. The flower competition is open to anyone who wishes to enter. If you have a single amazing Peony plant in your garden, bring in the best bloom and members of the Peony Society will show you how and where to enter it, even though it may beat out their bloom for the first prize. There are even categories specifically for novices. More information about this show and the Peony Festival can be found on the web sites of the Oshawa Valley Botanical Gardens; www.ovbgoshawa.ca and the Canadian Peony Society; www.peony.ca. Note that the Peony Show in the arena will open at 1:00 p.m. on Saturday after the judging is completed. In addition to the plants in bloom in the garden and on display in the arena, there will be two days of live presentations by a variety of Peony experts. You can learn everything from the very basics of Peony culture, to ways of choosing varieties to maximize the Peony season in your garden. There will be demonstrations on Peony grafting, digging and dividing Peonies and examples of how to use Peonies as featured landscape plants. Throughout the Peony Garden there will be a variety of related activities. There are Artists in the Garden painting the glorious blooms. There are light refreshments available in the Peony Café. The Master Gardeners and the Peony Society will there to answer garden questions. 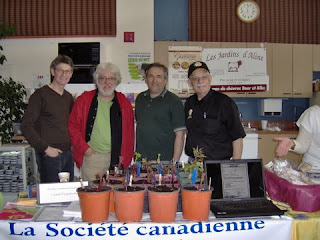 There will be a draw for Peony roots and live auctions for roots after each of the presentations. A list of speakers and times are available on the web sites. All of the above activities take place between 10 – 4 on Saturday June 12 and Sunday June 13 and there is NO admission fee. Just come out and enjoy the Peonies. 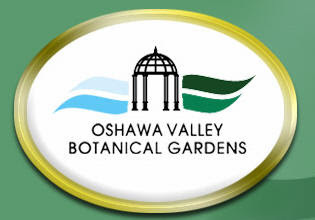 The Oshawa Valley Botanical Gardens incorporates a series of modern feature gardens linked by the parklands and natural terrain of the Oshawa Creek Trail system. Incorporating the stunning heritage gardens of Parkwood, the R.S. McLaughlin Estate, with up to a dozen gardens and pathways, the completed project will unite different areas of the city with a unique garden attraction that can be enjoyed by residents and tourists alike. The Peony Garden and Children’s Arena are located at 155 Arena Street just south of Adelaide Avenue in the Centre of Oshawa. More information may be obtained at the websites listed above, by calling 905-436-5636 x 2107 or emailing ovbg@oshawa.ca . The CPS Peony Show is open to all. Come & bring some Peonies! Les Jardins Botaniques de la Vallée de Oshawa présentent pour son sixième festival le 12 et le 13 juin 2010 la foire de la Société Canadienne des Pivoines. Les jardins auront plus de 300 pivoines en pleine floraison pendant le Festival de Pivoines le 12 et le 13 juin 2010. Le sixième de ces grandement appréciés Festivals Annuels des Pivoines sera le plus grand et le meilleur que jamais grâce à la treizième Foire de la Société canadienne des Pivoines. Une exposition de presque 1000 pivoines sur tige sera disponsible dans l'Arène des Enfants, rue de l'Arène, 155, Oshawa, à côté du Jardin des Pivoines. Toutes les fleurs seront mises en vue selon leur classification et leurs couleurs. Ceci est une possibilité magnifique de voir la large gamme de fleurs disponsible dans ces perennilaes (vivaces?) à longue vie. La compétition florale est ouverte à qui désire y faire part. Si vous avez une seule plante splendide dans votre jardin, apportez votre meilleure fleur. Les membres de la Société des Pivoines vous montreront où et comment la mettre en concours, même si elle fera concurrence à leur propre fleur pour le premier prix! Il y a même des catégories spéciales pour les novices. Plus d’information sur cette Foire ainsi que sur le Festival des Pivoines se trouve sur le site des Jardins Botaniques de la Vallée d’Oshawa, www.ovbgoshawa.ca, , et de la Société canadienne des Pivoines, www.peony.ca. La Foire des Pivoines dans l’Arène sera ouverte à treize heures samedi après les résultats des compétitions en plus des fleurs dans le Jardin et la mise en vue dans l’Arène, il y aura deux jours de présentations données par plusieurs experts à plusieurs niveaux en pivoines. Vous pouvez apprendre l’éssentiel sur l’horticulture des pivoines, ainsi que sur la sélection des pivoines pour maximiser la saison des pivoines dans votre jardin. Il y aura des démonstrations de boutures, de transplantation et de multiplication de pivoines, ainsi que de comment placer les pivoines dans le jardin. Il y aura des activités reliées aux pivoines à travers le Jardin des Pivoines. Les “Artistes dans le Jardin” peindront des fleurs. Des boissons et mets lègers seront disponibles dans le café. Les “Mai?tres du Jardin” et la Société des Pivoines seront présents pour répondre à vos questions sur le jardinage. Il y aura une tombola pour des racines de pivoines ainsi qu’une vente de racines aux enchères après chaque présentation. Une liste de présentateurs et des horaires sera disponible sur les sites sur la toile. Toutes les activités auront lieu de 10 à 16 heures, samedi, le 12 juin et dimanche le 13 juin, et il n’y a pas de frais d’entrée. Venuz jouir des pivoines! Les Jardins Botaniques de la Vallée d’Oshawa incorporent une série de jardins modernes rejoint par des parcs et terrains naturels dans le réseau de piste du Ruisseau d’Oshawa. En incorporant les éblouissants Jardins Héritage de Parkwood, les propriétés R.S. McLaughlin, avec plus d’une douzaine de jardins et de sentiers, le projet au complet unira différents emplacements dans la ville pour accueillir un jardin unique en son genre pris en valeur par résidents et touristes. Le Jardin des Pivoines et l’Arène des Enfants se trouvent à rue de l’Arène, 155, directement au sud de l’Avenue Adelaide au centre d’Oshawa. Plus d’information peut être obtenue sur les sites de la toile ci-haut mentionnés, ou en téléphonant au 905 436 5636 X2107 ou par courrier électronique ovbg@oshawa.ca . Venez et apportez quelques pivoines! 'Starlight' was acquired last year from Parkland Perennials. I wasn't dissappointed. When spring arrived and signs of life began to show 'Starlight' had 5 stems and looked like it would go forever. Even with our fluctuating spring weather, 1 week of heat to downright wintery conditions for 1 week and rain it still pushed forth and now it was showing 5 swelling buds. I couldn't (should have) remove the blooms for the first season but what a show. I am not sorry at all. Starlight, A.P. Saunders 1949, Herbaceous Hybrid, Single, Cream, 26" Early Parentage: Lactiflora x (officinalis x (mlokosewitschi x macrophylla)) Blooms of ivory occasionally flush with warmer tints and a cream and gold centre. 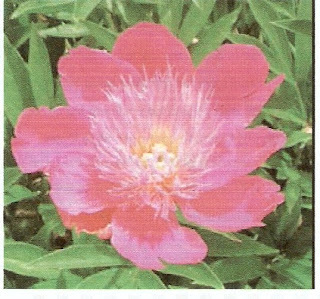 A Canadian Hybridizer Peony Garden is going to be created at the Peel Agricultural Societies property in Caledon just north of Brampton. Peel Teaching Garden, a not-for-profit group, plants and maintains all gardens on the property and with interest and enthusiasm the peony garden is slowly taking shape. We have chosen the site, with the help of volunteers the beds will be prepared over the spring and summer and ready for planting in the fall. We need help in acquiring Canadian hydridized peonies for the garden. If anyone would like to donate a root contact Margaret at plntlady@sympatico.ca . In return for your donation, Peel Teaching Garden will recognize the donation with a small sign. F.Y.I. Currently Peel Teaching Garden has donated land for me to plant seed for growing on. Volunteers have heard about and seen the trial beds and interest peeked has prompted the peony garden project. C'est une lactiflora, une plan exceptionnel par sa forme globale : une boule de feuillage d'ou émerge, au dessus, une autre sphère de fleur. Les fleurs sont nombreuses et beaucoup de fleurs secondaires; donc, sa floraison dure très longtemps...10 à 15 jours. Comme fleur coupée elle est très exceptionnelle ! It is the first week of February here in my part of the country. The temperatures are 50F+, the robins have returned and the grass that turned brown last fall has begun to show green. A walk through my peony fields shows several of the early varieties have become adventurous and are pushing their red shoots throught the ground. It is a bit early, but the soil is too wet and muddy to allow me to cover them, so will take a chance on a hard frost later. I live in the Similkameen Valley, which roughly parallels the U.S. border along Highway 3, which we call the crows Nest Highway. About 12 miles from here we climb a Pass and enter the Okanagan Valley at Osoyoos. The tip of the Sonoran Desert, which begins in Mexico and extends northwards to Osoyoos, ends here outside of our area. Some of the inhabitants - rattlesnakes, rear-fanged boa, scorpions, 26 varieties of spiders, and many more fauna reside here. We have beautiful birds, California quail, a very mild climate, (except for a couple of weeks in December and January) that all contributes to making this one of the most desirable places in Canada to live. But, like all Edens, it has its drawbacks. Here it is the soil and extremely hot weather in July and August. The soil is thin and composed of volcanic ash and some clay. If sand were to be added to this composition, then we would have cement. We farm cherries, peaches, some pears and apples, and also, 50 filbert nut trees. A large garden is planted for our own use. Each spring we amend the soil by adding well rotted cow and / or turkey manure; bone meal; composted garden refuse and leaves; wood chips from our tree pruning are used as mulch on the flowerbeds. To obtain the required moisture for the peony roots, we have installed a system of soaker hoses along each of the rows or around the beds and the water is turned on when needed during the night. Because of the lack of snowfall and rain in our area, fall planting is extremely difficult. Our land is irrigated by community water and this is turned on April 15th and shut off October 15th. So, I have been buying from suppliers who will ship in the spring. So far it has been a success. I have always grown a few peonies in my gardens wherever we have lived over the past 50 years, but never had the time to really investigate the many varieties. After purchasing this retirement property, I began adding as many plants as I could afford each year and now have nearly 100 varieties. My collection also boasts several very old varieties given to me from friends' parents' gardens and now with retirement, I will be able to spend more time looking for their names. Two years ago I began contributing data to Michael Denny's Bloom Dates project. We discovered that several of my varieties have such widely differing bloom times from the rest of the country that it will be worthwhile to log this data in minute detail to discover the reasons for the differences. This is an exciting time for me. Not many people get the chance to do what they want this late in life. The more I read, the more books I find and add to my collection, the more beautiful blooms I get to see in my garden, the more eager I become to try new peony plants. For the first time I have planted seeds after watching John Simkin's video and what a joy to see the roots a few days ago! I had tried earlier without success and thought it was my inexperience that had caused the failures. Happy peony gardening to you all!! ce qui représente, dans les termes d’aujourd’hui, la boutique où les herboristes européens vendaient leurs remèdes. Les médecins de la Chine et du Japon ont aussi reconnu les propriétés médicinales de la pivoine. En Chine, elles y étaient connues probablement 600 ans avant Jésus-Christ et certainement avant le 1er siècle av. J.-C. Au début du 8e siècle av. J.-C., la pivoine a été apportée de la Chine au Japon, non pas pour ses propriétés horticoles, mais plutôt pour sa valeur médicinale. En Europe, la première pivoine à être utilisée comme plante médicinale a été Paeonia mascula ou la pivoine « mâle », native de la Méditerranée. Lors de la période médiévale, P. mascula a été introduite en Bretagne, probablement par les moines. John Gerard (1545-1611/12) et Nicholas Culpepper (1616-1654) ont fait référence à P. mascula dans leurs herbiers. Bretagne et avait remplacé P. mascula comme pivoine de choix pour fins médicinales. En Chine et au Japon, les pivoines herbacées et arbustives étaient cultivées comme plantes médicinales. En Europe, P. officinalis était cultivée par des moines dans leurs jardins d’herbes; par des médecins et apothicaires dans leurs jardins médicinaux; et par de simples individus dans leurs jardins de ville et jardins de campagne. Et puisque durant la période médiévale et plus tard, la femme au foyer était tenue responsable de prendre soin des malades, les femmes auraient été impliquées dans la culture des pivoines. Dans les foyers fortunés, la maitresse de maison aurait eu un rôle de supervision, mais dans des foyers moins fortunés, elle aurait fait le travail elle-même. Après la récolte, les racines de pivoine séchées pouvaient être façonnées en amulettes et perles ou moulues en poudre. La racine en poudre était utilisée seule ou mélangée à d’autres ingrédients pour former des poudres médicinales ou électuaires. Les racines étaient la base de l’eau de pivoine. La recette de Culpepper suggérait de laver les racines, de les couper en petits morceaux et ensuite de les faire tremper dans du vin blanc sec pour au moins 24 heures. Avant d’être utilisée, l’infusion était filtrée. Une recette plus élaborée impliquait d’utiliser 18 racines de pivoine fraichement cueillies, plusieurs graines, feuilles et fleurs de lavande séchées bouillies ensemble dans plusieurs gallons de vin et d’eau. Les remèdes préparés à partir de pivoines étaient employés pour traiter diverses afflictions. Du temps de l’ancienne Grèce jusqu’au 19e siècle, certains problèmes reliés à la grossesse, à la naissance d’un enfant et aux soins donnés aux enfants pouvaient être soulagés avec une préparation de pivoine. Hippocrate recommandait l’ingestion de graines de pivoine pour « l’hydropisie» et la dislocation de l’utérus. Les arrêts des menstruations pouvaient être traités de la même façon. Un électuaire du 17e siècle était réputé pour soulager ce qu’aujourd’hui on décrit comme étant la nausée, les vomissements et l’estomac dérangé du début de la grossesse. Une infusion de racines de pivoine aidait à expulser le placenta. Afin de protéger le nouveau-né des crises et du haut mal (épilepsie), un herboriste allemand du 18e siècle recommandait de baigner l’enfant dans de l’eau de pivoine fabriquée avec des fleurs de pivoine bouillies dans du vin. Les enfants bénéficiaient également des forces protectrices que leur conféraient les perles de racines de pivoine suspendues à leur cou. Chez les adultes, la démence, la mélancolie, les cauchemars, les étourdissements, la passion hystérique, la jaunisse ainsi que le blocage du foie et des reins étaient sensibles aux traitements par des remèdes de pivoine. 19e siècle. Cette longue utilisation peut être expliquée en partie par la nécessité de devoir se fier à ses propres ressources médicales. À l’exception des gens de la ville, très peu de gens avaient accès à un médecin ou à un apothicaire. 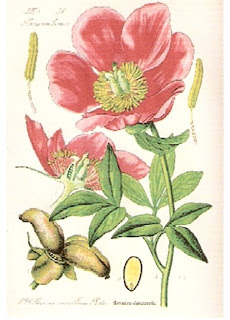 Avec l’introduction et la promotion des drogues synthétiques à la fin du 19e siècle, l’utilisation d’herbes, incluant la pivoine, a diminué. Cependant, la réputation de la pivoine comme plante médicinale n’est pas complètement anéantie, car encore aujourd’hui la médecine chinoise continue d’utiliser la pivoine dans la préparation de médicaments.